1983. Ferran Adrià’s work experience at elBulli. 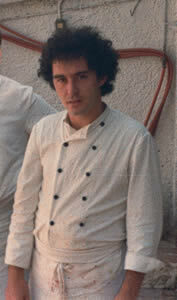 Between mid-1982 and the end of 1983, Ferran Adrià was doing his military service in the navy, in Cartagena. In the summer of 1983, at the suggestion of another Catalan recruit, Fermí Puig, he decided to spend his month’s leave in elBulli, a restaurant he had never heard of. When the month was over, he was happy with the experience and immediately arranged to join the staff the following year. arrival at elBulli, "act one"
I first heard about El Bulli while I was hundreds of kilometres from Roses, further down the Mediterranean coast. In 1983 I had been doing my military service for almost a year in Cartagena, in the Navy. I was 21 years old, and because I had worked in restaurants before my call-up, I was lucky enough to be sent to work in the Admiral’s kitchen. At the beginning it was a comfortable posting, although I later saw that it involved the responsibility of thinking up new menus every day for this high-ranking officer and his family. By chance, at the beginning of that year, another budding young chef, also Catalan, was posted to the kitchen to assist me. 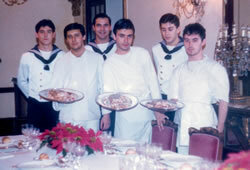 He was Fermí Puig, now chef at the prestigious Drolma restaurant in Barcelona. As everyone knows, military service has its rules, its hierarchies, its rituals and customs. In that kitchen, the old hand was me, and the new boy, Fermí. Whether it was to win my confidence or to share experiences outside the barracks, the fact was that that spring, he suggested that during our month’s leave in August, I should do a stint in El Bulli, a restaurant on the Costa Brava where he had worked. He told me it was one of the best in Spain, and that it had two Michelin stars. Little did he know that at that time I had no idea what that meant. However, I took note of what he said and perhaps began making plans to spend a pleasant summer at the beach; in fact this is probably what influenced my decision, rather than the idea of going to work in a restaurant during my month’s leave. Meanwhile, we devoted ourselves to our first culinary experiments, and I made my first foray into nouvelle cuisine guided by chefs such as Michel Guérard and the Troisgros brothers, thanks to the books that Fermí had brought with him. For several months, we copied the dishes from these recipes and served them to the Admiral. …but true. In fact, El Bulli was one of the few Spanish restaurants to have been awarded two stars in the Michelin Guide, at a time when there was no establishment in Spain with the highest category. There I met the alma mater of the restaurant, its manager, namely Juli Soler, with whom I have shared the history of El Bulli ever since. As well as Juli, the team consisted of Jean-Paul Vinay, chef de cuisine, Annick Janin, in charge of patisserie, Christian Lutaud, assistant chef, and a squad which in summer amounted to some twenty people between the kitchen and the dining area. That month was highly intense in all senses of the word. From a personal perspective, there was the work itself, stimulating and new, but also the nights out in Roses. Professionally speaking, the stint in El Bulli was a real immersion in the world of haute cuisine, since it was the first time I had heard of all the trappings of this world: the critics, the running of a restaurant, gourmet guides, and so on. At that time, the El Bulli style was nouvelle cuisine, not just because of the nationality of Jean-Paul, Annick and Christian, but also because the movement was at its height just then. The experience was so positive that, at the end of my leave, it was suggested that I join the staff the following March, the beginning of the 1984 season. I completed my military service in mid-December 1983, and perhaps with the idea of confirming the commitment I had made in the summer, I decided to go back to Roses for a few days. That trip was something special, as the journey between Barcelona and El Bulli, which usually takes just over an hour and a half, took Fermí and me three days. Needless to say, we did not follow the direct route. This was "act one" of the five acts making up my career in El Bulli, five decisive moments that may be summarised as follows: the summer job in 1983, joining the staff at the end of March 1984, my promotion to chef de cuisine along with Christian Lutaud in October 1984, taking over the kitchen on my own in March 1987 and the setting up of the partnership with Juli in 1990. The most remarkable thing about all this is that chance was what determined my career, except for the last item, which was the only thing consciously planned. Everything else happened as I have related it, it is true, but it could easily have turned out otherwise. The only thing I am sure of is that El Bulli changed my life and made me what I am. It only remains for me to thank all those who have done their bit to turn El Bulli into something more than just a restaurant: it is a way of understanding life.